Welcome to the amazing world of cool hacking tricks. If you are looking for some really very interesting tricks than you are in right place. In this Blog I will share with you every tricks and tips which you need to know. I have also included many Blogger tricks due to increasing users in Blogger platform and is the time for new blogger trick. First go to blogger home and sign in with your account. After that you have to go to Layout section. Click on Layout in Blogger Dashboard. Then add a new Gadget. 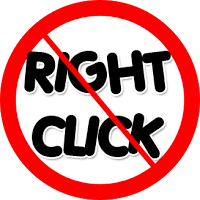 Now the time for the code that will disable right click in your Blog. Paste the code given below in the pop up. Done. You have blocked right click on your Blogspot Blog. Now say bye to malicious bloggers. If you only want to disable text highlighting or text marking that will prevent users from copying than try the code given below. This code will not allow text highlight on your Blogger blog. Just Paste the code given below instead of above code. If you are facing any sort of problem to block right click in your blog then you can comment. Do you like this cool trick, you may also like to subscribe to our free newsletter.